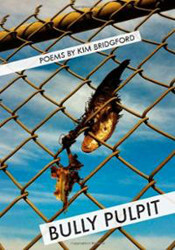 Kim Bridgford’s latest book of poetry, Bully Pulpit, explores the multifaceted, recurring issue of bullying. Bridgford dissects what it means to “bully,” “label,” or “objectify” an individual or demographic as she gives voice to a broad scope of “bullied” persons, such as Tyler Clementi and Rosa Parks, also among her subjects here. Chilling and unafraid, Bridgford’s poems range from conversational elegies about teenage victims of bullycide to persona poems embodying iconic mythical or literary oppressors and their victims. Bridgford knows this subject well. The second section of the collection, “Private,” is deeply personal: opening up a world of first-hand experience to her readers, the poet provides a context that sheds light on the experience of those more publicly bullied. Bridgford’s own encounters offer a loosely structured, self-conscious ride from poems such as “Genealogy” to “What Happened,” with stops at “Unfairness,” “Brokenness,” and “Paradise” in between—poems that together expose “bullying” and its painfully tangled roots. That bullying and public exposure are often bound together is seen in “Somewhere,” the seamless villanelle that closes “Public,” the book’s first section. A compressed and poignant reiteration of the book’s opening six poems, “Somewhere” brings to life the horrific news stories of teen suicides, with despair’s self-destructive impulse set against the bully’s typical rationalizations: “…they were just playing/or making group dynamics manageable.” Both bully and bullied step from front-page headline into sharp focus: “It changes everything: public displaying/Of someone else’s shame. Now vulnerable,/Somewhere in the dark you’ll hear the crying.//And it is not a game… /Somewhere, by his own hand, a teen is dying.” Through direct language and command of form, Bridgford captures the risks and repercussions of thoughtless shaming. The closing section provides an unexpected turn into new realms. “Mythological,” divided into five subsections, expands on themes of power, manipulation, and weakness as reflected in characters from literature, myth, and movies. With the exception of a series of poems about Persephone, this section is composed almost entirely of dramatic monologues which shed light on the tragedies that result from coercion and force. Desdemona’s voice, for instance, rings with a sharp, painful plea, “Don’t smother me with anger. Let me go./My handkerchief, sewn sweet with light and berries,/Is more than gift to me; it is what buries.” The final poem of this unique and powerful book offers a reminder that even these mythological poems, regardless of their original vocabulary or the era of their source, embody the dynamics, and tragedy, of bullying. Kim Bridgford’s words erupt from these pages with controlled force, as each poem finds its way, explicitly or indirectly, into our backyards, our playgrounds, and our shopping malls. Bully Pulpit aches with painful relevance: it is a book both public and deeply personal, one that speaks up for the vulnerable while asking us to speak out, too, as seen in the closing lines of a powerful villanelle: “Someone inside the group is isolated/If you don’t speak the cycle is repeated” (“Watching”). Leah Rosenzweig is a recent graduate of Loyola University Maryland. She is currently living in Washington DC, pursuing a career in the nonprofit sector. Leah was a 2009 recipient of 5 gold key awards in poetry from the Alliance for Young Artists and Writers.